The Photographic World of Drew Gardner: Successor to the X100 is close-or so it would seem. Successor to the X100 is close-or so it would seem. I was looking at my favourite and most used camera last night. Which without doubt is the most flawed camera I own too. 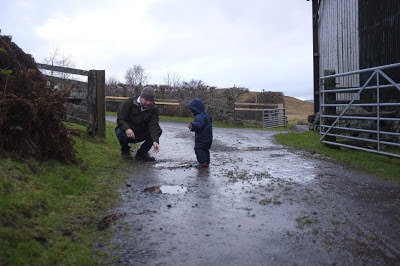 Much has been said about the Fuji X100 and depending on your view it is either brilliant or maddening. Personally, I think it is both. I started to wonder when it's successor would be announced. A quick trawl of the web turned up this seemingly very promising rumour that it would be announced at CES on Monday. Well, the X100 is due for replacement and Fuji have sent out a tantalising invite. Added to this, the X100 broke cover at a similar time of year when it was first launched and camera manufacturers do tend to be creatures of habit. The X200, or whatever they decide to call it, should be a relatively easy win. What does it need to build on the 'legend'? The 'big boys',particularly Canon, spend lots of time, effort and money on developing very powerful processors, for their DSLR's. Why does that matter? The processor is the heart of a digital camera, the foundation which controls everything the camera does, and what speed it does it at. This in my opinion was the single biggest failing of the X100 which left the camera feeling dimwitted on far too many occasions. Write speed in RAW is very slow, and woe betide you if you read from the card and reinserted it without reformatting. I was reminded of this at the weekend, when the fast card I was using counted for nothing as you could almost feel the camera searching through the card working out where the free space was before it was ready to go again. A process which can take some minutes, with shots missed as you wait for it to get its act together. I know Fuji do not have the R&D budget of Canon but surely they can do a better job than they did the first time around? I believe the processor had a big influence on this but no matter what, I don't want the X100's successor to struggle as much as the current camera does. Admittedly it did get much better with the myriad firmware updates but the bottom line is that it was often too slow and could be caught out in some relatively 'easy' AF situations, particularly when focusing on something closer to the lens. While they are at could they give the camera a closer focusing capability WITHOUT having to resort to a macro setting? Saving the Macro setting for things that are REALLY close. Just every so often the X100 will expose two almost identically framed shot's completely differently. For seemingly no good reason. Here are 2 shots taken moments apart on Aperture priority. 4. A more intuitive and readily accessible menu. I have been using the camera for a good while now and it never ceases to amaze me just how concealed some parts of the menu are. A good study of the competitions offerings should show them the way to go. The X100 isn't too bad on it's battery, but when it goes it is not progressive. You get very limited warning and then it is flat. No nursing it through, it 'falls of a cliff' and if you haven't got a spare its all over. On a DSLR I have headed out of the door for a shoot with the battery on 75 percent power and I knew I would be ok, something I would not dream of doing on an X100. All of these flaws should be easily fixable, and I sincerely hope they do fix them and transform the camera into what it should have been at launch. But I have a worry which comes in the shape of the Fuji X-1 Pro. Firstly let me say it does take a cracking good picture, and is a quality camera. It's just I would never own one. Never is a long time but I do mean never. Size, (relative)sloth and the sound of that focal plane shutter. Combined, these simply rule it out. It is very good for a camera of its type, but it is really not so very different in size to a Canon 5d MKIII which outperforms it on every front, is quieter in 'silent' mode to my ear than the focal plane shutter in the Fuji X1 Pro. Ok, it is not a fair comparison, but if I had to leave the house with one camera and know I would get the shot no matter what it was, I would choose the 5D MKIII. If the Fuji X1 Pro's used a leaf shutter(in the lenses) instead of a focal plane shutter, it might be a different story. 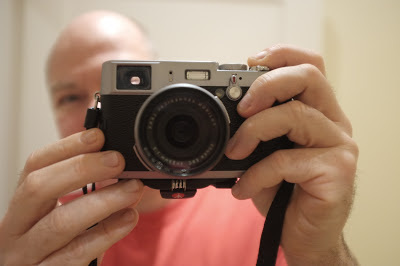 Fingers crossed they get it spot on this time with the X100's successor. Drew, the erratic exposure thing is a recall item. The aperture sticks.... Look into it and get it fixed. Fuji is well aware of it and will get it fixed and returned quickly. I loved the X100 when I heard of it and saw it, but I went in other directions - infrared, full spectrum, more film. Thanks for the leak link, looks promising but the proof of the pudding will be in the eating. Having an X100 and going onto the forums is a bit like going onto the Internet when you you have a slightly sore ankle and by the time you have read all the online experts you are convinced you need your whole leg amputating. The aperture fault does sound like it is right though, I don't know when I will get round to sending it off though. As maddening as it is the X100 is the camera of choice in these parts. It is pretty remarkable that no other manufacturer has latched onto this retro quality camera lark, Fuji must have made a sack full of money. It looks like you have the sticking shutter problem. Fuji do sort this out VERY quickly. Mine was fixed in four days - including shipping time. Well the X100s press release is out. It looks good. Though I do wish Adobe would sort out xtrans processing. Thanks for that, off to the fixers it is then. I do hope the X100s does not fall victim to silly little faults like these which prevented the X100 from being the camera it should have been. The press release does make interesting and very promising reading, I will be giving my own views on these in an updated post. As for the X Trans raw processing issue, it is a big one. Not only Adobe are being challenged by this, Capture One 7 pro does not support files from these sensors either. If they don't I believe they will lose out . I have just posted an analysis based on the leaked press release.